WACO, Texas – The Seward County Lady Saints finished their season on Wednesday, securing a 6th place finish at the NJCAA National Tournament, the second-best finish in school history. Patricia Panta fought hard to get into the Championship match in the No. 1 Singles draw, but in the end fell Celia Morel of ABAC. She dropped the first set 6-2 but rallied in the second 6-4 to force a decisive third set. Panta came close to completing the rally but fell in a tight 7-5 third set. With the loss, she will finish in 3rd place at the NCJAA National Tournament. After losing her opening round match on day one, Martina Borges overcame all odds to win three straight matches and win the No. 5 Singles Consolation Bracket. She defeated Mariah Turney of Seminole State in a nail-biting 8-6 win to secure the title. 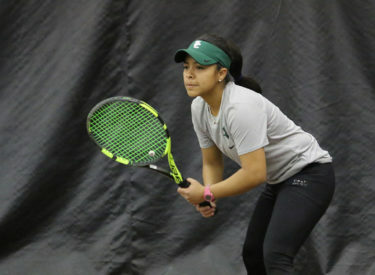 In doubles play, Maria Aveiga and Alena Macharova gave the Lady Saints a shot for another Consolation Title, advancing to the Championship round of the No. 2 Doubles Consolation Bracket with an 8-2 win over Jennifer Hundsnurscher and Tania Ramirez of Laredo. In the title match, Aveiga and Macharova ran away with the win, beating Meghan Houk and Lien Nguyen of Pima 8-1. Seward finishes the tournament with 26 points to clinch 6th place with one day to go. Fellow Jayhawk member Cowley finished in the Top 10, as Cowley finished in 8th place with 21 points, while Barton finished in 18th place with 12 points. Tyler leads the pack with 45 points while Hillsborough is in second with 41 points.